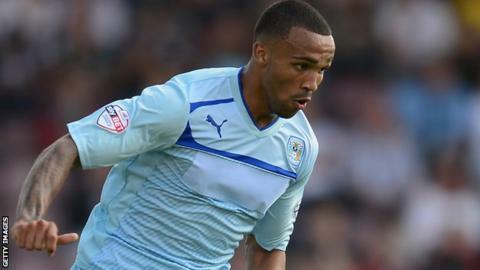 Coventry City striker Callum Wilson has deflected speculation about his future by pointing out that he is contracted to the Sky Blues until 2016. "I'm a Coventry City player. I'm under contract here," Wilson told BBC Coventry & Warwickshire. Despite missing two months this season with a dislocated shoulder, 21-year-old Wilson has weighed in with 22 goals. That earned him a place in the PFA League One team of the season as well as links to a move elsewhere. But Wilson signed a new contract five months ago until at least 2015, to which the League One club hold the option of extending by an extra year. "I signed a new contract in November so I'm here for another two years," Wilson said. "It's all rumours and speculation so just let them carry on. As far as I'm concerned, I'll be here next season. "I've got my off-season programme to stick to and my dates to come back for pre-season training." Before this season, Wilson had only started three league games for the club, since turning professional in 2009. But, in a campaign in which the Sky Blues' promotion prospects were hampered by a 10-point penalty for the second successive year, Wilson's goals eventually ensured that Coventry remained in the third tier. "At the beginning of this season, I was expecting to make 20 appearances and score around 10 goals," he said. "I blew that out of the water. But I still think there is more to come from me." Coventry end the season on Saturday at Bramall Lane against FA Cup semi-finalists Sheffield United, who have soared up the table on the back of a run of two defeats in 18 league games. But Wilson, who netted in Coventry's 3-2 home win over the Blades in October, is keen to end the campaign on a high. "We were rock bottom at the start of the season but we've come a long way since then - we want a league position which reflects that."